On this page you will find a map of Cyprus and some information about the country. The map is a detail of a Map of the World published by Planet Poster Editons in Germany. Capital: Nicosia (= Lefkosía, Lefkosa). 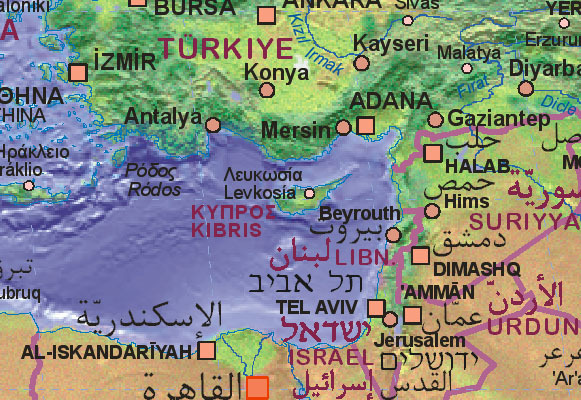 Map of Cyprus with surrounding areas. - Landkarte von Zypern. - Mapa de Chipre. - Carte de Chypre. The capital of Cyprus ist Nicosia, which is also the biggest city of the country. Flights to Cyprus usually go to either Nicosia or Famagusta. The island is subdivided into the southern part, which is governed by the Greek-speaking Cypriotic government, and the northern part, which is under a Turkish-speaking administration and as a sovereign country only recognized by Turkey. The official language of the southern part is Greek, in the northern part Turkish is the official language. Tourism is of extremely high importance in Cyprus. We would appreciate more detailed information, also about tourism, sea voyages, guided tours, flights, diving courses, or individual tours to Cyprus.